Sprout Organic Foods is a company co-founded by renowned chef Tyler Florence. They make food for babies, toddlers and kids, most of which comes in resealable, squeezable pouches. Everything is certified 100% organic. I received some samples and gave to my son. His favorite was Peach Multigrain Cereal with Raspberries and Peach Pumpkin Pie with Coconut. He was able to eat straight from the pouch, with my help. I also received Fruit & Veggie Crispy Chews which are tiny pieces of fruit and veggies with puffed rice (which adds a little crunch). Not only were these a big hit with the baby, my older kids loved them and kept asking for more. I don’t blame them – they taste like fruit roll-ups but are completely natural and sweetened only with fruit juices. They’re also great for adults. Just eat them with a handful of almonds for a quick afternoon snack. They’re only 60 calories per pouch and 15 grams of carbs. 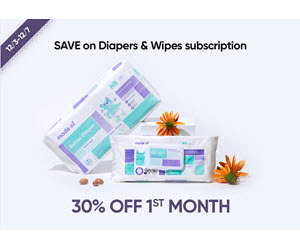 You can buy Sprout products at major retailers such as grocery stores, drugstores and online retailers such as Diaper.com and Amazon. If you have older kids who love nuts but are tired of eating the same thing over and over again (we do lots of raisin-almond mixes at home) Pistachio Chewy Bites are a good option for variety. These powerhouses contain pistachios, dried cranberries, agave syrup and other all-natural ingredients. They’re very sweet and sticky and perfect for lovers of pistachios and dried cranberries, like my husband, who raved about how delicious they were. They come in a bag of six individually-wrapped pieces. You can buy Pistachio Chewy Bites on Amazon. Price is $8.99 per package.